more information about this filter? When he starts modulating the resonanse it goes insane ! Yes, if there were ever a filter which warranted a built in joystick, this is probably it. Will post a pic of a bananafied one amongst frac modules in about three or four weeks. Oh, yeah. There was a cool dual Borg with a stick once upon a time. Very interested in this. Sounds very cool. the joystick should have CV out! I wonder if one can use a dual filter like the cwejman dfm2 for similar effect. FYI, the 5u version uses 18db filters (more parts) and the 3u uses 12db filters. Try mixing outputs from filters you already have with a polarizing mixer. You might find something you like. Which is pretty exciting as their version of the Benjolin is superb. FYI, the BugBrand Crossover Filter is another dual filter which can subtract one LP output from the other. Switches allow various configurations. Standalone box with 1/4" jacks in and out. Does KlangbaukÃƒÆ’Ã‚Â¶ln sell these modules? Klangbau sells the one in the OP, and has a Benjolin too. I finished a modul called "CV - Prozessor"
A little joystick processes any signal and invert it. Push stick to get a trigger signal. If no signal is in, then you have 5V to work with. Very useful for live performance. 5HE version of TwinPeak, with stick, I built also. Normally it is no problem to produce a bananajack version. an update was posted on the epoch website regarding the delay. 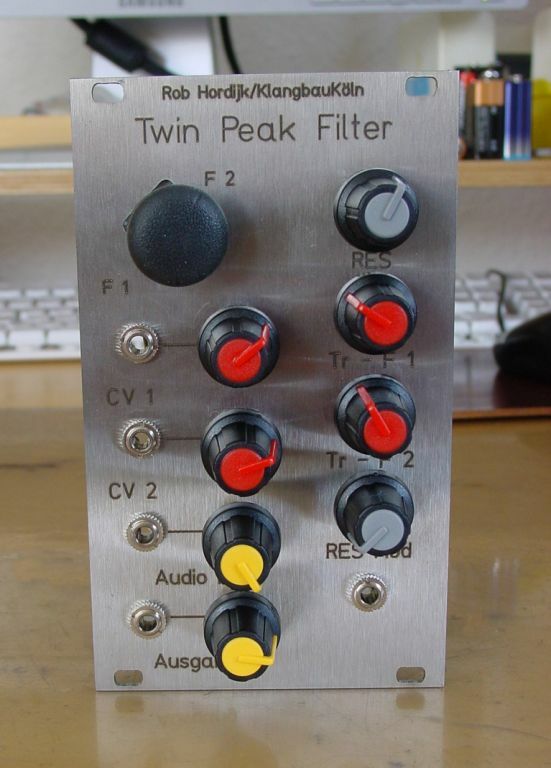 I build a few TwinPeak Filters. The new pcb-layout is 90mm deep and frontpanel is 75mm or 15 BP. Audio or CVin is directly routed to filter tracking (Tr-F1 and F2). It is a filter but most use it as soundsource. So is this a new revision from Rob? i traded my epoch benjolin for the klangbau twin peak filter and i am sooo happy with it! a sound i only get with a wavefolder and the res-4...and with the two tracking knobs on the right side you can really sculpt the sound. i made some recordings and will upload one in the near future.